The WannaBeatles are turning into seasoned road warriors. We've been traveling a lot this summer, meeting new friends, playing new places, putting miles on Nathan's van, loading gear into the trailer. Last month, for example, we did three nights in a row, covering 1350 miles (Laurenceburg TN and South Carolina), but that weekend started on Friday afternoon. This past weekend was the biggest of the batch, three successive nights in three different towns in Virginia, a total of 1435 miles. This weekend tour was built around a special performance in Virginia Beach, with their local symphony, as part of their 50th anniversary as a city. 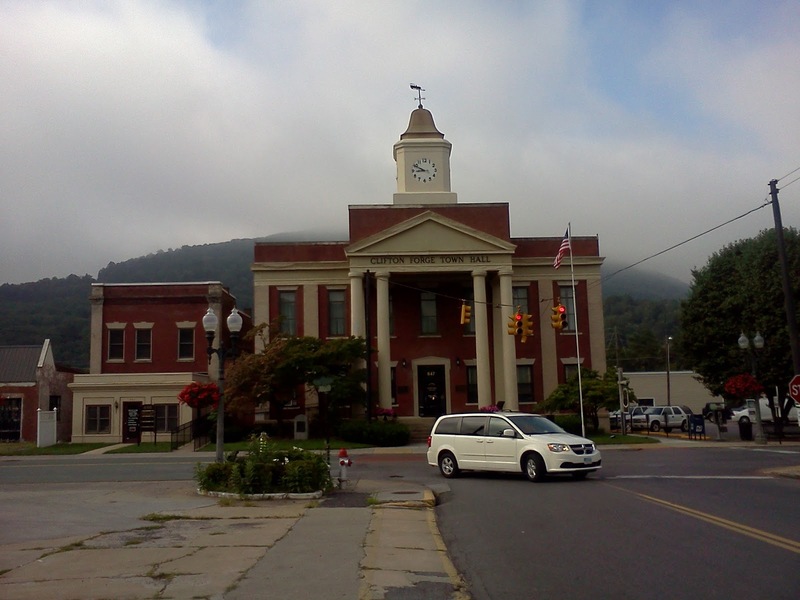 The three towns were Danville, Virginia Beach, and Clifton Forge. We were blessed with beautiful weather the whole way, and got to see plenty of a beautiful state, from the coast to the Allegheny mountains. Here we are on the road. Self-portrait on I-40, driving Nathan's van. 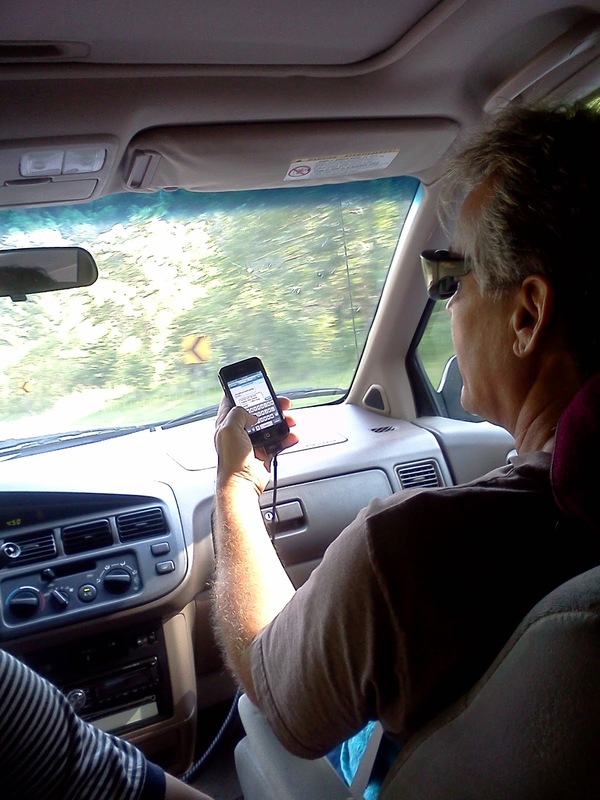 Dennis hard at work in our "mobile office." 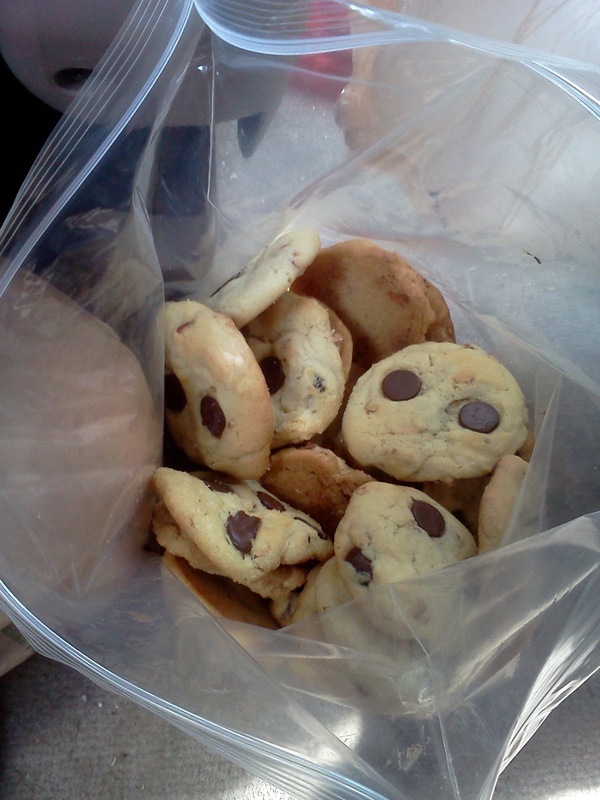 The smartest thing we did was leave early, driving to Danville on Thursday, so we could wake up already there on Friday. There was saw our venue, the North Theater, which was also our lodging. It looks good at night with the lights on. 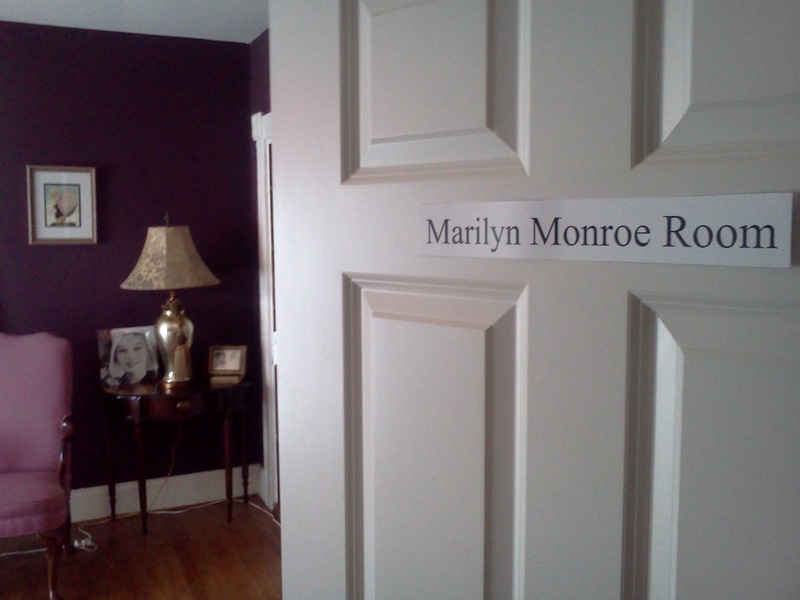 The owner of the theater, a magician named Wayne Alan, has built rooms onto the theater for performers. Each room has a show-biz theme, which became apparent as we walked in. David and Nathan took the Sinatra room. Dennis was happy in the Marilyn room. My bed was a fold out couch in the kitchen. 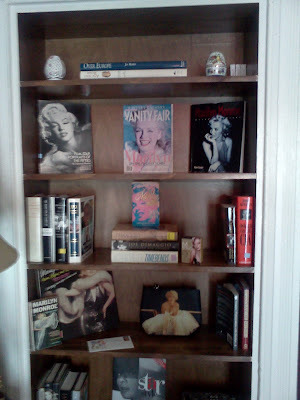 It didn't have a celebrity theme, but I claimed being "in the kitchen with Dinah," and suggested that Dinah Shore might be a good choice for future decorations. We woke up Friday morning decently rested, searched out a local IHOP for breakfast, and found a couple of local music stores to catch up on supplies. 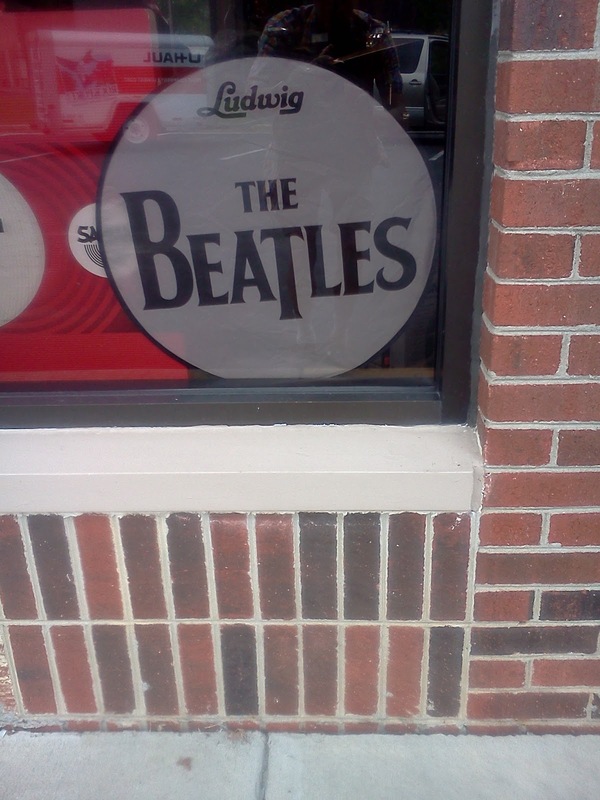 At one of them, The Music Stop, there was a Beatles drum head in the window. 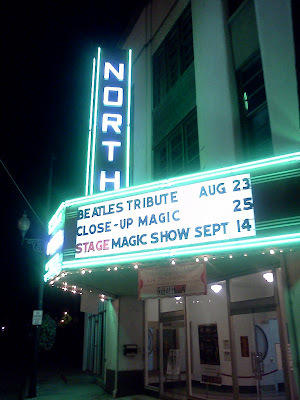 We learned that the North Theater was built in 1947, and showed movies like "It's A Wonderful Life" when it first came out. It had passed through various owners until Wayne bought it a few years ago. He sees it as part of a revitalization of the neighborhood, in a town that is rebuilding its tourist appeal. 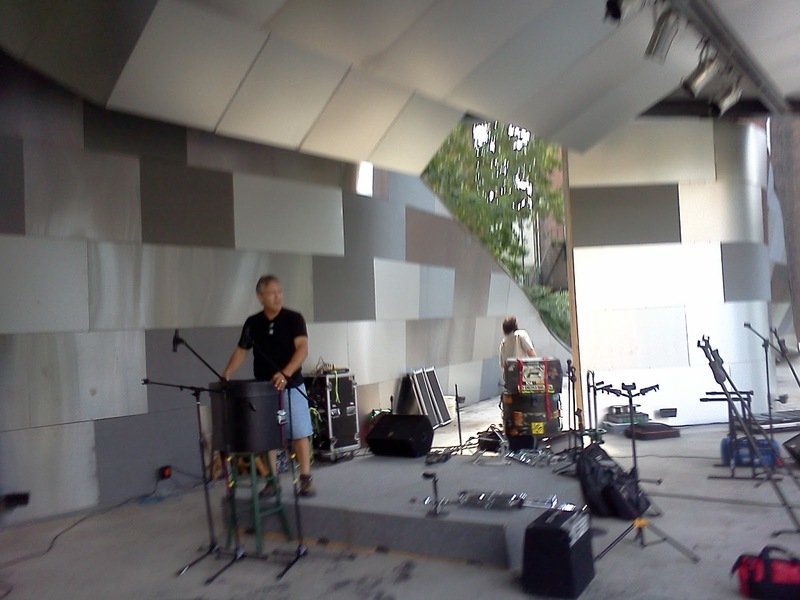 Here's Nathan onstage during our set up Friday afternoon. 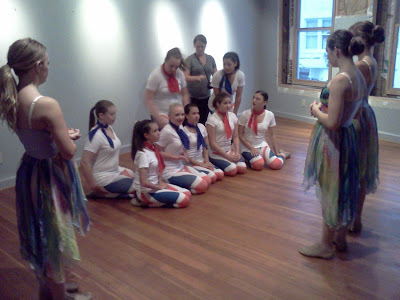 One extra treat for the gig was the involvement of the Danville Academy of Dance, which provided choreography for "I Want To Hold Your Hand" and "Here Comes the Sun." The girls on "Hold Your Hand" wore white shirts, colored scarves around the neck, and boldly colored tights in the pattern of the union jack - a fresh touch. The three dancers for "Here Comes The Sun" were more delicate, like spring flowers. Their dance was a beautiful match for the music. One more memory of the gig was David getting injured in the line of duty. He had forgotten the special drum stick with tambourine rattles attached, and felt that "I Am The Walrus" needed the sound of the tambourine added to the regular drum kit, so he found a way to hold a stick and a tambourine in his right hand at the same time to accomplish that trick. The problem was that holding those two items simultaneously rubbed against his finger, which caused some bleeding. He bravely wrapped it in duct tape, and we bought some peroxide the next day to disinfect it. Another special award for bravery beyond the call of duty. Saturday, we left Danville and drove east for Virginia Beach, along Rt. 58, a beautiful divided highway lined with trees. Nearing the tidewater area, we drove through Norfolk, and saw the huge shipyards of nearby Newport News. When we arrived at Sandler Center, we pulled up into a very professional loading dock, where a team of friendly crew members helped unload our gear into a lovely facility. We met Rudy, the technical director with his glasses, grey beard, black shirt, and the bearing of a college professor, along with several members of his staff, also wearing black. We were greeted by Bobby Melatti, who helped make this gig possible. Bobby is a New Yorker who's lived in Virginia Beach thirty years without losing any sign of his accent. 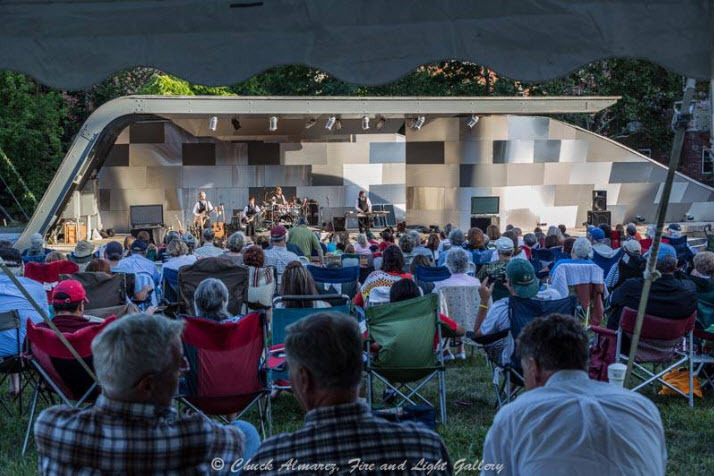 As a local event coordinator helping the town celebrating its 50th anniversary, he's helped us put the gig together over the last few months. 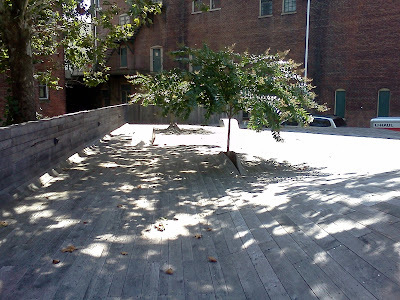 It helped that he and Dennis connected as fellow New Yorkers. We were all charmed by his street-wise manner and energy. He reminded me of Felix Cavaliere of the Rascals, and that became a point of mutual appreciation. We learned from Bobby that the Sandler Center cost $50 million, which is what it cost to build the Metropolitan Opera House in Manhatten, where Bobby had worked back in the sixties. 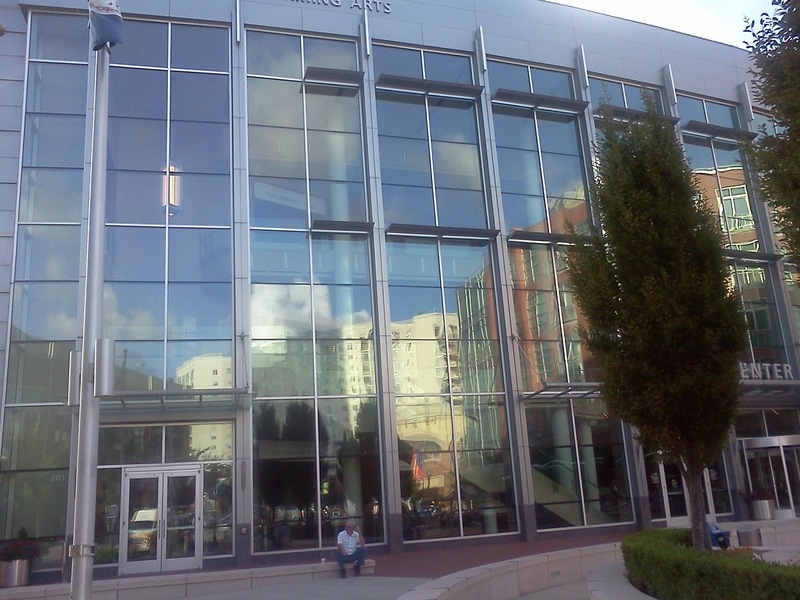 Sandler Center is a magnificent and beautiful facility which seats 1200. It's part of a beautiful downtown development, next to a tall Westin Hotel, where we had individual rooms. So this was a luxury stop for us, probably the finest gig we've ever had. 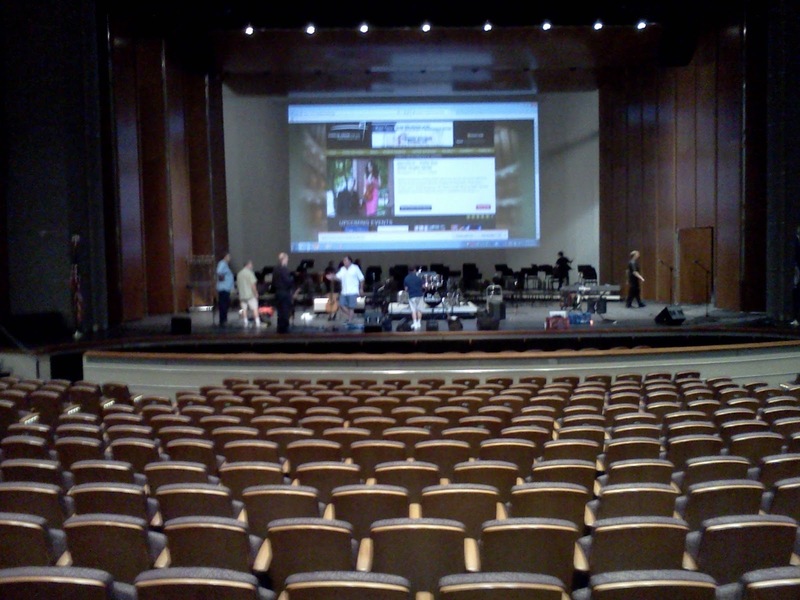 The stage at Sandler Center, during our setup. They had a large screen for our videos. I couldn't resist walking around the room playing the sax, checking out the acoustics. Here's another cell phone self-portrait, from the sound booth. 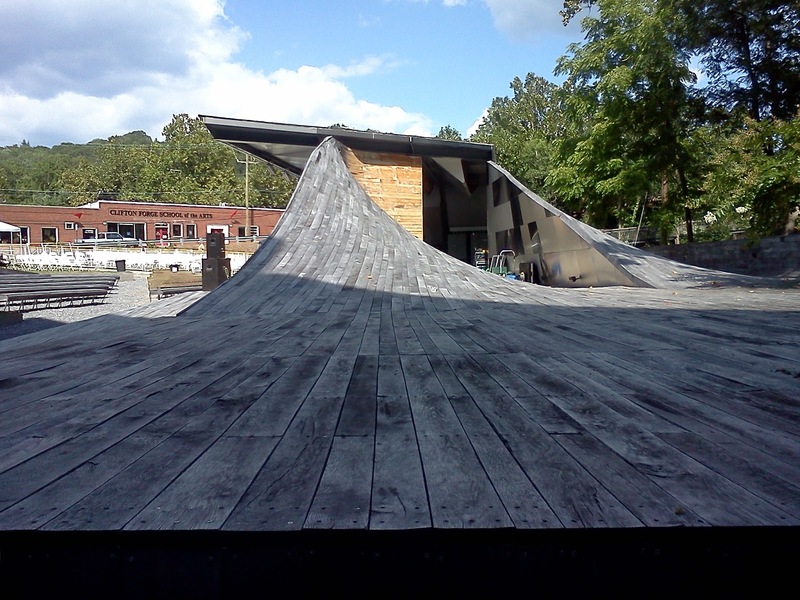 Here's the exterior of the building. As readers of the blog have learned, we've been preparing for this gig, which is a joint adventure between us and Symphonicity, the local symphony orchestra. 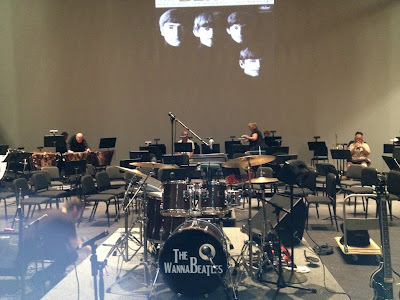 After establishing that we would play at the Sandler Center with the orchestra months ago, we've been sweating out the details - learning "I Am The Walrus," and rehearsing other songs we rarely do, like "She's Leaving Home." But the biggest amount of work was preparing the charts for the orchestra. This is not only a musical chore, but an administrative one, as we are dealing with a librarian who assembles and collates the charts, and the conductor who reads a master score as he rehearses the group. And WannaBeatle Nathan stepped up to the plate in a big way, keeping his laptop busy during many of our previous road trips, as he tweaked the notes and beautified the layout of each part, sending digital files via computer to the team in Virginia Beach, in time for their rehearsals before the gig. 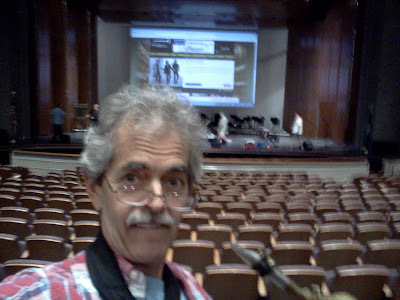 And so our arrival at Sandler Center, after unloading and setting up, led straight into an afternoon rehearsal with the full orchestra. We met Dave Kunkel, their conductor, who had already demonstrated his sense of humor in an exchange with Nathan over the decision of how to execute the clinking of champagne glasses in the song "Yellow Submarine." Dave suggested that Symphonicity was more of a beer stein symphony than crystal glass. 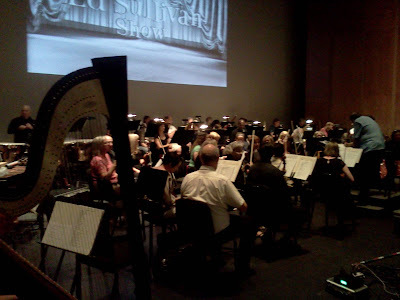 We were fascinated and excited to be playing with a full orchestra. There was a beautiful harp in front, the instrument featured on "She's Leaving Home." I made a point of meeting the piccolo trumpet player, a very nice lady name Robyn, who was very generous in sharing her knowledge and skills. She even let me try her piccolo trumpet, which I discovered was in the key of A, rather than B flat. 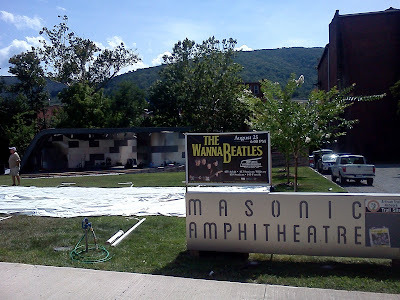 We shared our admiration of David Mason, the British musician who played the famous solo on "Penny Lane." She confirmed that he had played a piccolo trumpet in A, which is actually used more often than B flat. Robyn's particular trumpet had four valves and a removable pipe, which allowed it to be played as either A or B flat. She confessed that hitting that high note at the end of the solo was not easy. It actually was easier for me on the soprano sax than it was for her on the piccolo trumpet. But there's no question that the solo sounded better on the authentic piccolo trumpet, and she played it well. We decided that I would play the last high note, and she would play the rest of the solo. She also agreed to come up to the front of the stage, joining us on that song. This level of involvement and cooperation was typical of our experience there - everyone seemed very friendly and cooperative. We spent two and a half hours going through every part of the show that involved the orchestra. David - our drummer - and David - the conductor, were the two cotter pins that kept the whole show together, tempo wise. 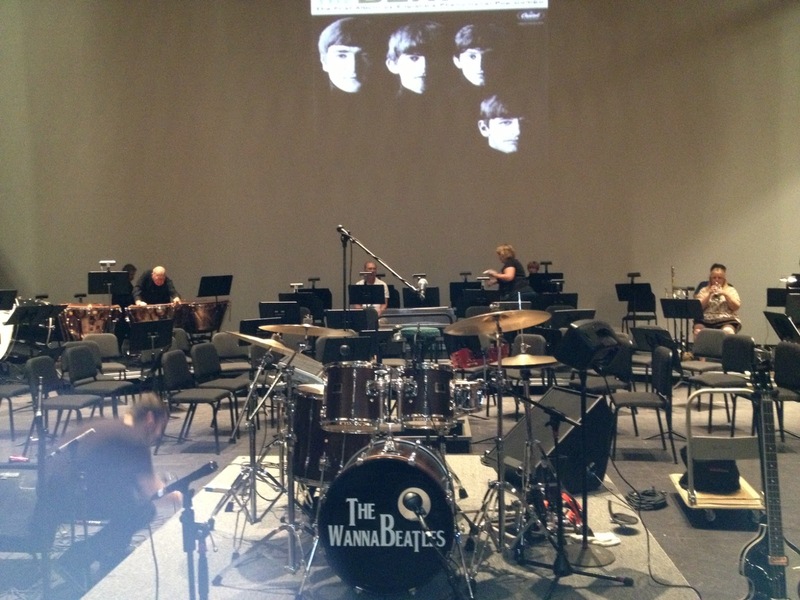 They were facing opposite directions, but WannaBeatle David had a rear view mirror right beside his high hat to keep the conductor in view for maximum coordination during endings and other tricky parts. We had bought that mirror at an auto parts store in Danville the day before, along with a goose neck mic stand attachment, to mount it securely for that purpose. There wasn't much time after rehearsal to relax. But there was ample hospitality in the rooms behind the stage, including a green room with small kitchen and sandwiches and tv screen showing the stage. We had time to eat, do a sound check (the orchestra, it was decided, would get no microphones), check into our hotel, get dressed, and get back to the Sandler Center. David and Nathan both had guests - David's wife Alice, and his daughters Gabrielle and Shaina were with us, and Nathan's wife Sally, and another couple they knew from Vermont, Alan and Monique. We were able to accommodate all these guests with various configurations of rooms and roll out beds among our four rooms. 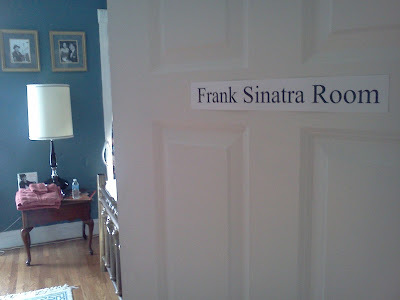 It was a great place to bring family, a great experience for us all, and a blessing to have such nice rooms available. We had a great show. The orchestra sounded great. 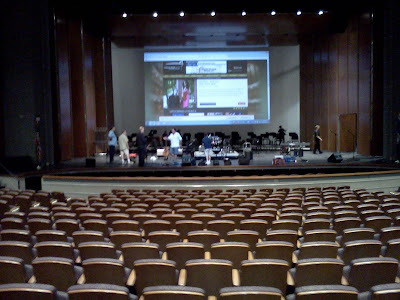 Our videos were shown on a huge screen behind the orchestra. Our song "In '63" went over well. 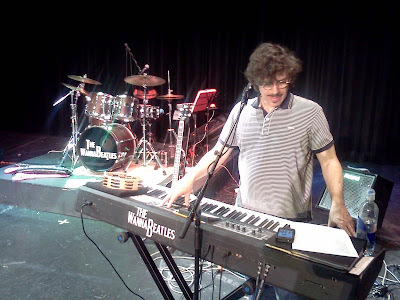 It was the last song of the first set, which meant that its memorable melody was still circulating in our heads - and the audience's - during the intermission, which is a pleasant reminder for the songwriter. After the show, posing with our "James Bond," who came onstage during "Live and Let Die" to set off the fireworks and play air guitar. He did a great job. We even received a plaque from the city after the show for our involvement in their 50th anniversary celebration. And the tour goes on. 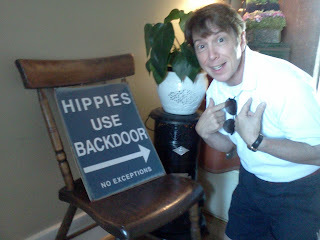 Sunday morning, we left for Clifton Forge, our third Virginia destination. Another beautiful day, and another distinctive experience. One thing that made it personal for me was realizing that Clifton Forge was close to Lexington, where my brother lives. I sent an email to my brother Doug, who confirmed that he could come to the show. And, since he's a musician, I suggested that he join us on "When I'm 64," which has a clarinet section, for which we had charts. 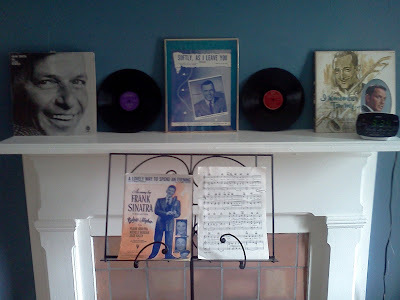 When Dennis heard my brother would be there to play clarinet, he upgraded the idea to a Jerry Lewis comedy bit, where he would tell me, onstage, "Bryan, I know you want to play clarinet on this song, but you're just not good enough. Are there any clarinet players in the audience?" At which point, my brother, appearing to be a random stranger in the crowd, would raise his arms and shout, "I'm a clarinet player! And I've got a clarinet!" 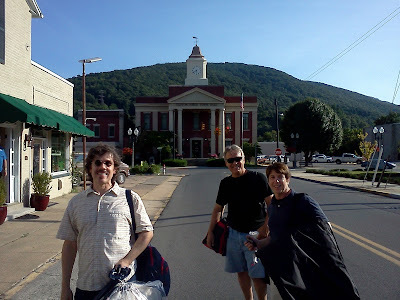 Beyond that brotherly connection, Clifton Forge was charming on its own. 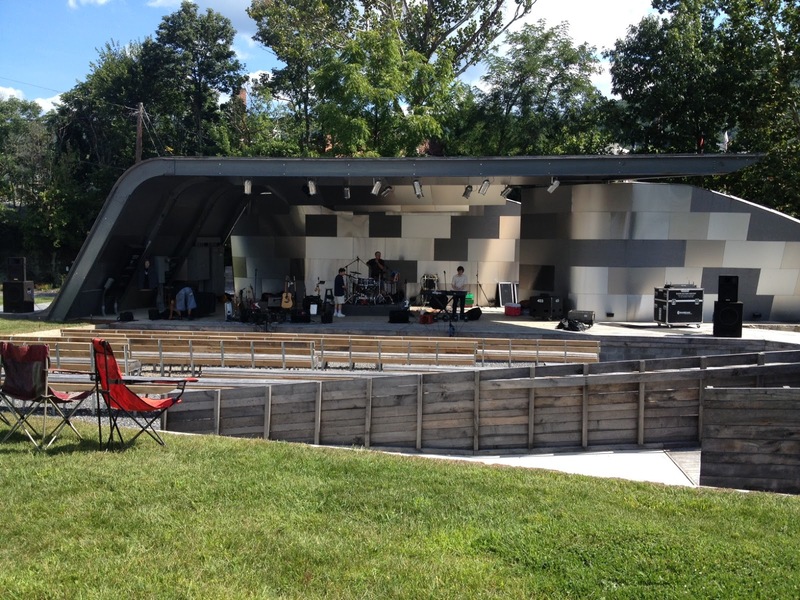 First of all, the venue, the Masonic Amphitheater, is architecturally unusual, full of curves and built out of panels of three different metals: aluminum, stainless steel, and titanium. We discovered that it was designed and built by a team of third year architecture students from Virginia Tech. A sunny afternoon in Clifton Forge - arrival. After sound check, we were offered a meal at a local restaurant, Vic's. This is a small town, where everything is within a few blocks. We walked over to Vic's to meet our host Steve Greenblatt, another New Yorker, whose dad was also a cook and restaurant owner. Steve and Karen had prepared us three different pizzas, along with delicious locally grown cantelope, home grown tomatoes, and a salad with their own recipe of blue cheese dressing. We found out Vic's was built in 1922, and had always been used as a restaurant, so it had lots of atmosphere. Steve had opened up his restaurant on a Sunday just for us. He was happy to get our signatures on some posters for the concert. He shared tales of his years in Nashville, when he worked as executive chef for Chaffin's Barn Dinner Theater (around '99 and 2000). 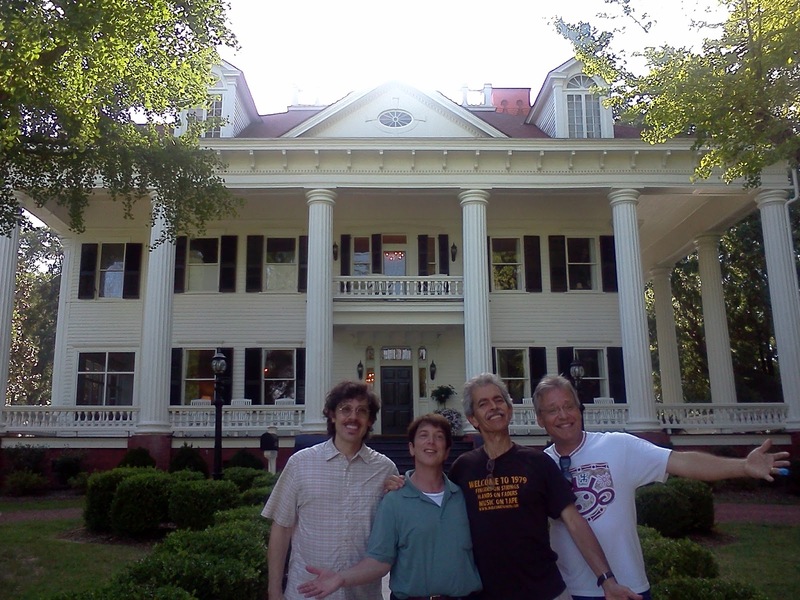 Here are the other three WB's walking from the Masonic to the Red Lantern, the charming B&B where we had rooms. The show was plenty of fun. We had dancers of all ages get up on stage with us, and my brother Doug playing the extra clarinet part on "When I'm 64," with no rehearsal. A volunteer go-go dancer during "Can't Buy Me Love"
We had time to enjoy more hospitality the next morning. We had a beautiful breakfast of pancakes, scrambled eggs, bacon, sausage, biscuits and coffee at The Tea Room, cooked and served by Barbara, just a few doors down from Vic's. We also got a tour of the Masonic Theater, built in 1905, undergoing a massive restoration. 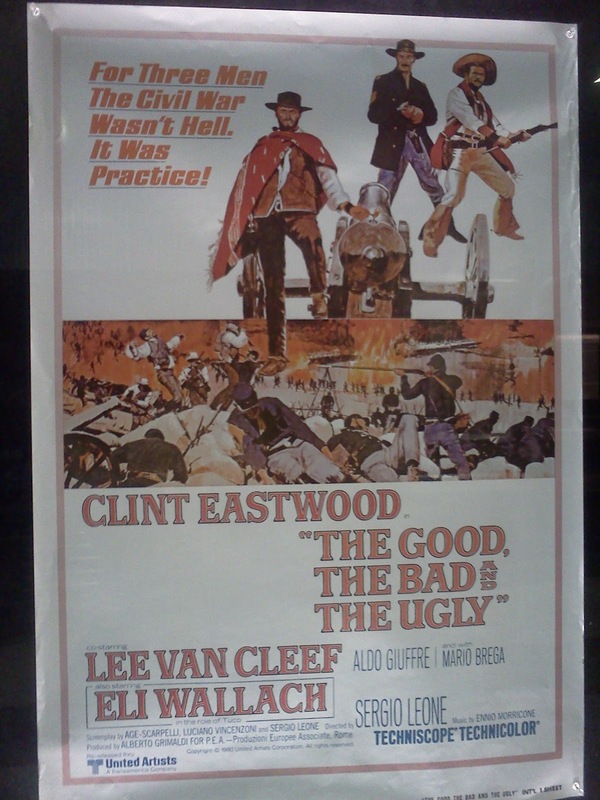 We were thrilled to hear that Roy Rogers and Trigger had actually appeared on that stage. Clifton Forge is nestled in the Allegheny mountains, which gave us a surprising chill for an August morning. 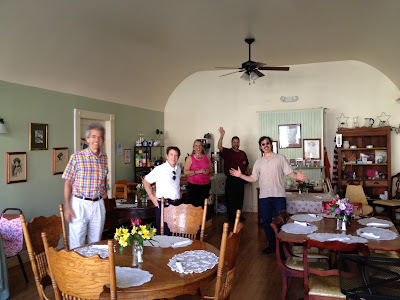 After meeting Steve, and Barbara, and Wilma - who booked us there - and Jo Anne, who hosted us at Red Lantern - and John, who showed us the Masonic Theater, and others who are involved in restoring the city, we got a great impression of a great place live. 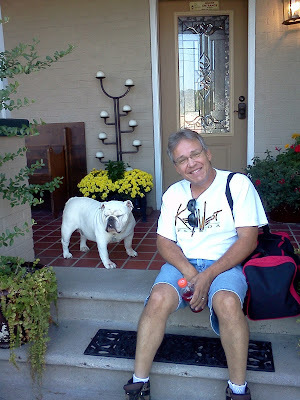 Here David says goodbye to the bulldog who is the mascot of the Red Lantern Inn. And we drove home, but didn't unpack our trailer, because we had another gig the next day. 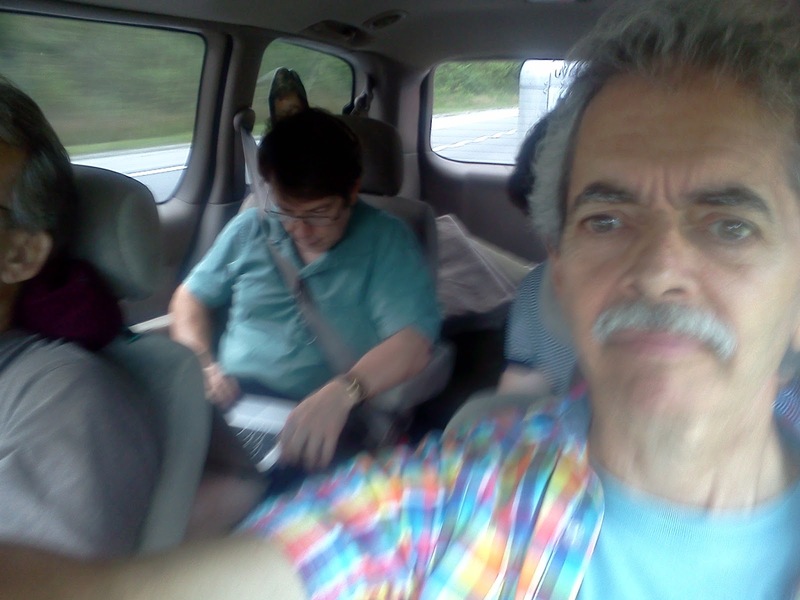 Monday was the drive home, then Tuesday was the drive down to Pulaski for our show at Martin Methodist College, a return after four years. But this blog has gone on too long already, so we'll pause till another report. 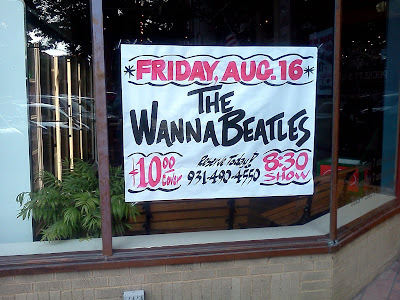 It's an exciting time for the WannaBeatles. This past weekend included another show at the new Puckett's in Columbia, another sold out night with lots of new fans, along with another delicious meal from their kitchen. This time it was their special of the night: salmon with crab meat, over asparagus, with creamed sweet potatoes and Belgian cord bread - made on a waffle iron. Three out of four of us ordered that special, and enjoyed it. 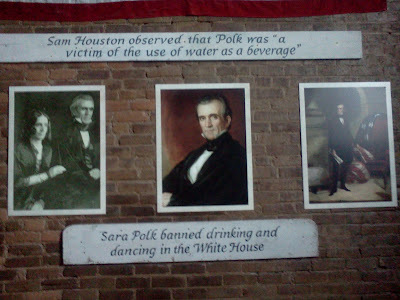 Then, a glimpse at one of the extra rooms - this one called the Polk Room, commemorating the 11th U.S. President ("the least known consequential President" according to Wikipedia), who lived in Columbia. For some reason, the hand painted signs emphasize the Polk family's aversion to alcohol. 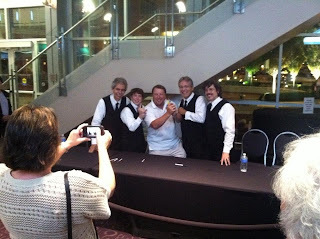 We had a great time in Columbia, especially when an entire table cheered loudly after our version of "I Am The Walrus." After the show, someone from that table told us that there were musicians in the crowd, who were skeptical about anyone attempting such a difficult song, so when we did it, they were impressed. We were glad they appreciated the effort and enjoyed the song. 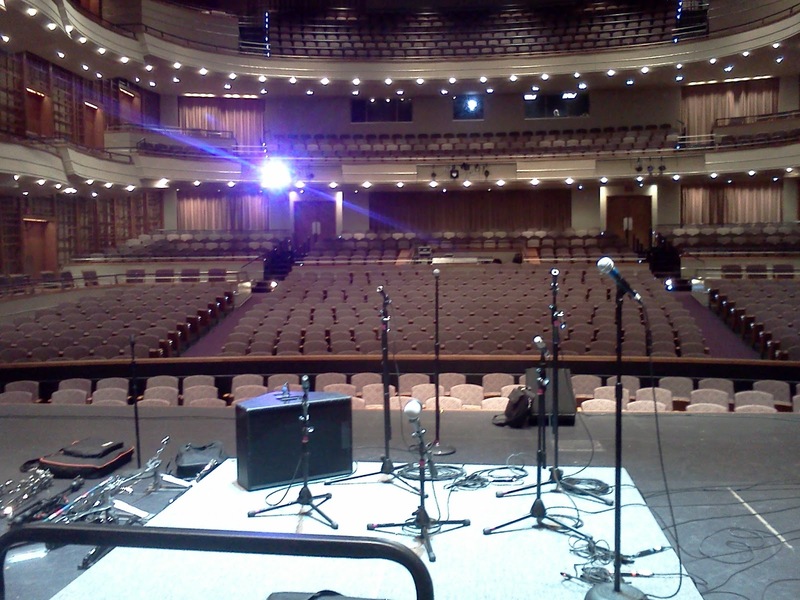 Next week is our gig in Virginia Beach, at the Sandler Center, with Symphonicity, their local pops orchestra. We've been writing charts, talking with their technicians, and preparing new material for the show. 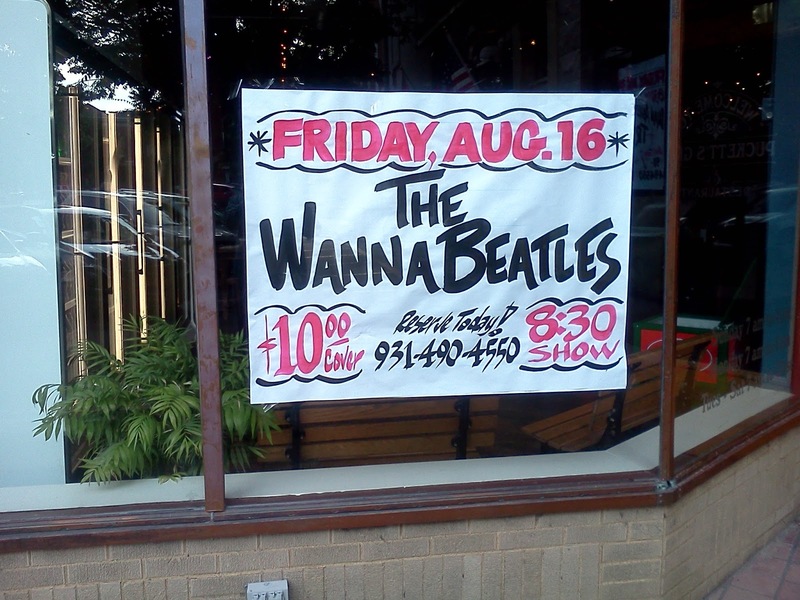 Half of the WannaBeatles are bringing family members to the show - David's wife Alice, and Nathan's wife Sally are both coming. Readers of the blog know that we wrote and produced a special song for the occasion, "In '63," which commemorates a year that was important for the Beatles, very eventful for popular culture in this country, and also the year that Virginia Beach was officially founded. And now, we've see the results of a video that puts together our song with the celebration of the town's 50th anniversary. 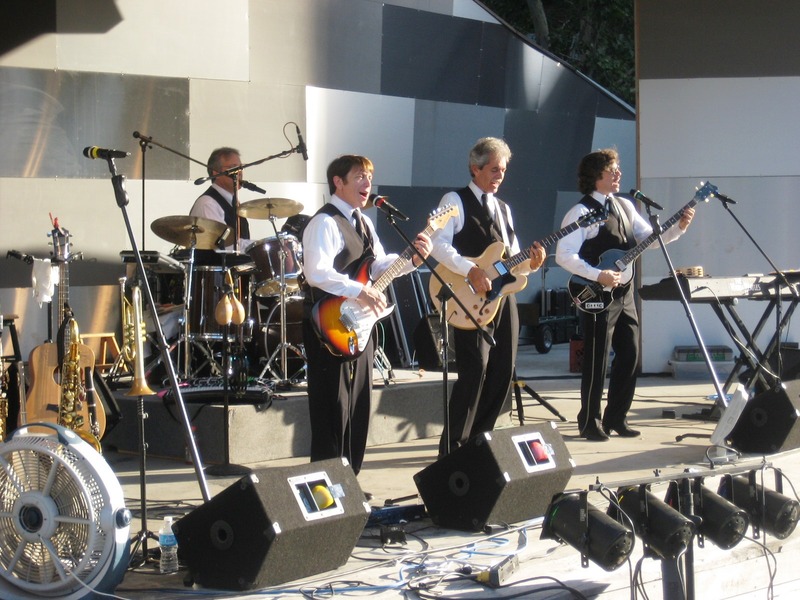 It's very enjoyable, as a WannaBeatles video. It shows many images from the song, from JFK to hippies and political protest on through Lassie and Annette. 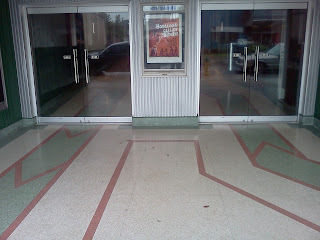 There's even a brief glimpse of us performing onstage, and a view of a poster advertising the show. But mostly it's about Virginia Beach. Next week, a report on Virginia. We just finished a fun weekend of travel. Well, two nights in a row - a Thursday and Friday, driving home on Saturday - not exactly a weekend. And because the first night was in Lebanon, less than an hour from Nashville, we could sleep in our own beds that night, then leave the next morning for our show in Georgia. WannaBeatle David, being a drummer and acutely aware of the physical process of loading gear, mentioned earlier in the week that it would make sense for us to have a trailer at the gig in Lebanon, so we could pack our gear into it that night, to be ready to leave early the next morning for Georgia. 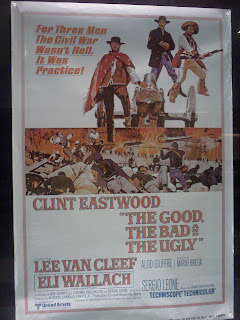 It was decorated with lots of movie posters. 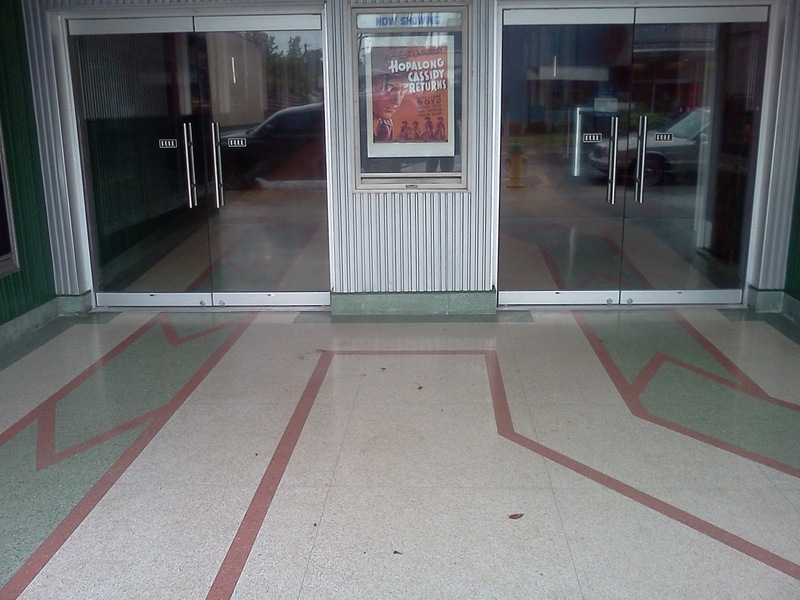 Here's the new entrance. I like the contrasting colors and geometric shapes of the tile. 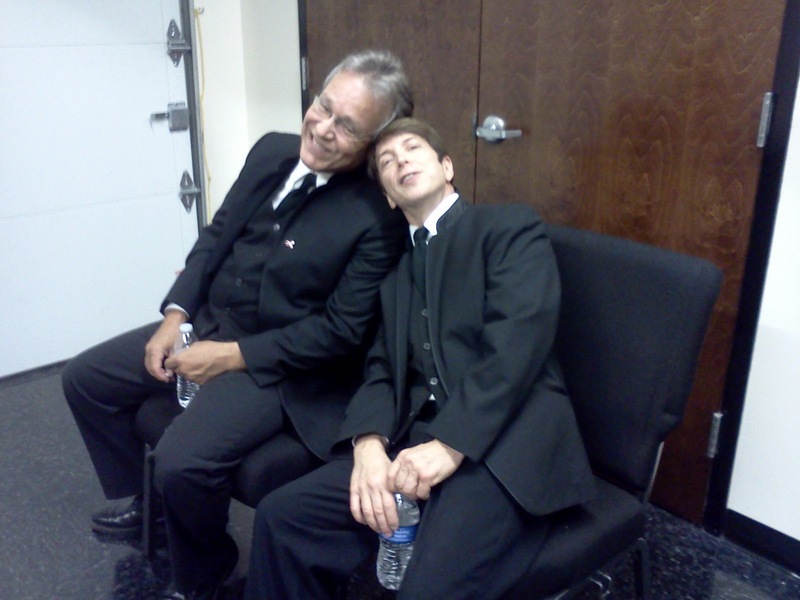 David and Dennis in our nice dressing room before the show. 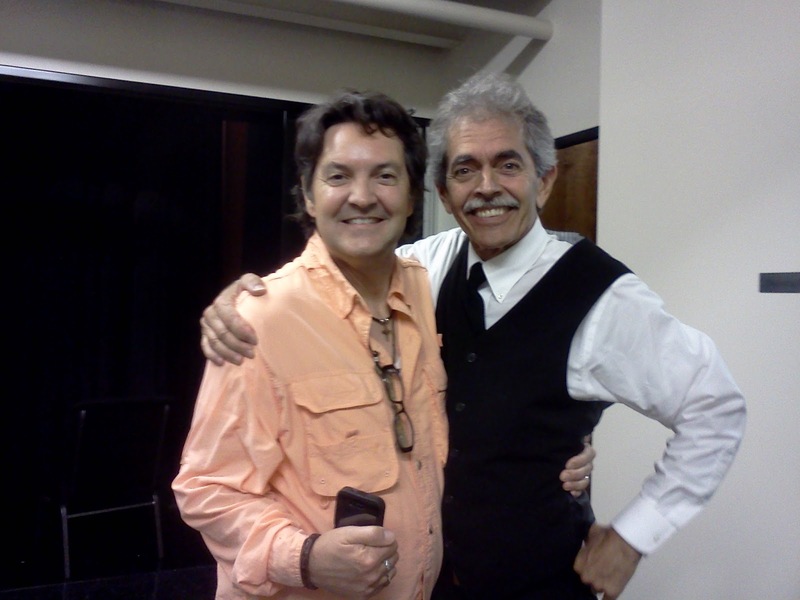 One friend who showed up is Butch Baker, a singer I've known and enjoyed for years. Butch came backstage to see me, and I was happy to see him. 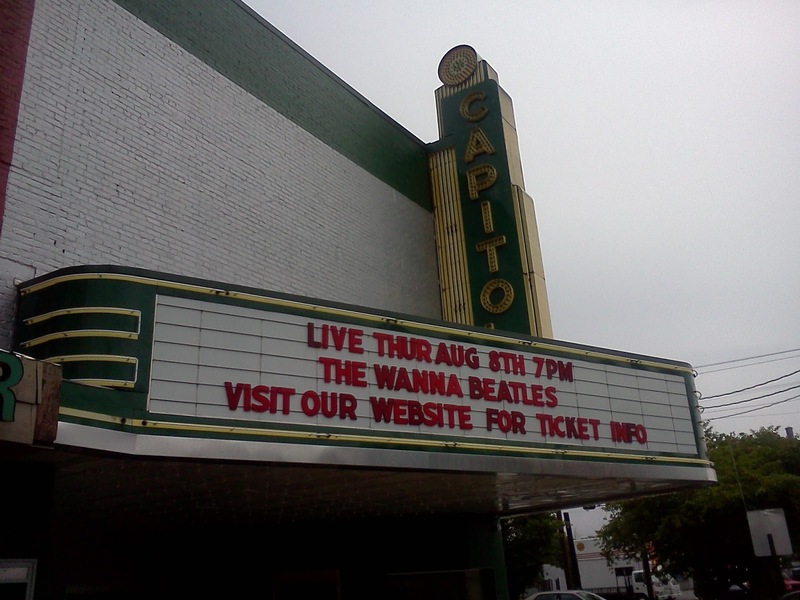 As it turns out, the woman who booked us at the Capitol Theater, Amy Harris, is also a friend of his, and they both attend the church where WannaBeatle David works at worship leader. Our show in Lebanon included a local string quartet, who joined us on "Yesterday," "Elanor Rigby," "Live and Let Die," and "Back In The U.S.S.R." This was plenty of fun for us, and for them, and for the parents of the young musicians. And so we packed our gear into the trailer that night, then Nathan kept it at his house, while we all slept in our own homes. The next morning, we took off for Covington, Ga., which is about an hour east of Atlanta. Although it was raining in the morning, there were no major snags, and we pulled into Covington around 3 pm, with blue skies and a few puffy clouds. We didn't have to stop for lunch, because of the generosity of Amy in Lebanon, who had provided enough food for us to take with us in the van on the trip to Georgia. We were charmed by the town. And we're not the only ones. Talking to our sound crew and local host, we soon learned of the many credits Covington has enjoyed being featured in movies and television shows, such as the first two seasons of "Dukes of Hazzard," "Vampire Diaries," and the tv series "In The Heat Of The Night." 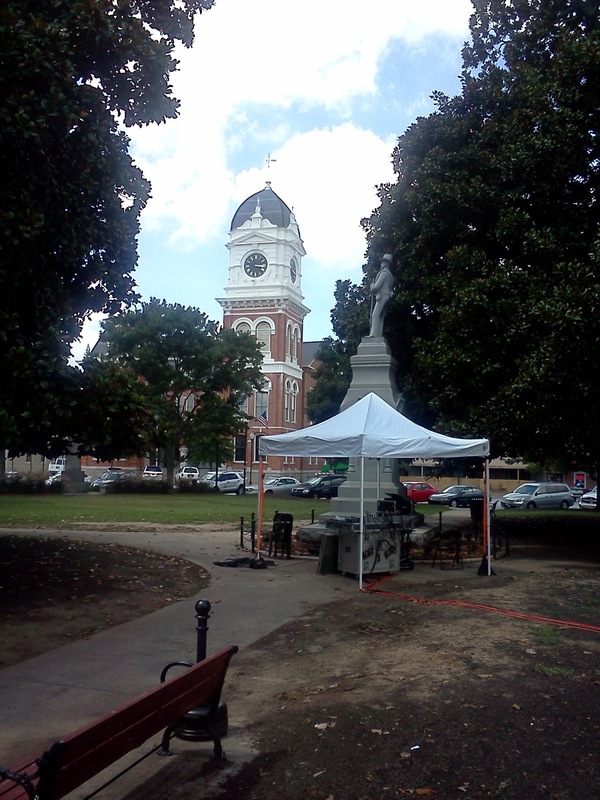 Here's a view of the clock tower and Confederate monument on the own square, where the sound mixing tent was set up. 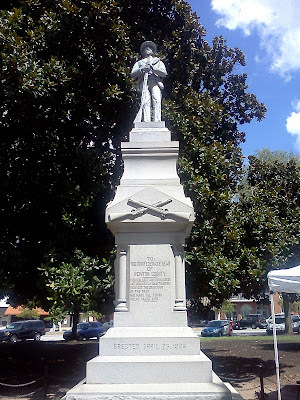 Like many Southern towns, Covington has a statue to honor its Confederate dead. This one was installed in 1906. 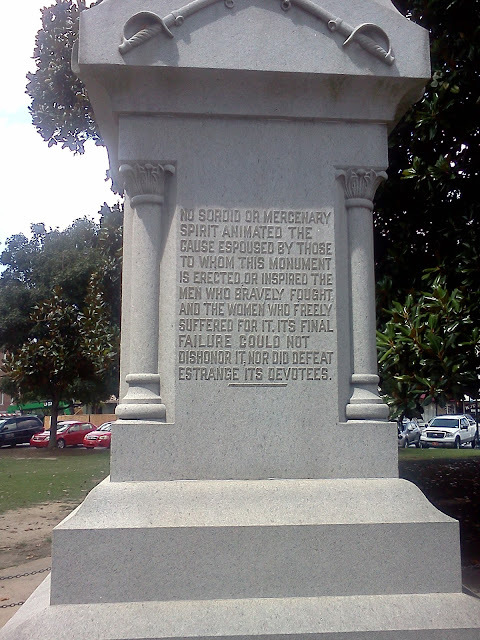 The role that the Civil War played in American history is complex, with ramifications still affecting us today, so it's not easy to make simple statements that accurately summarize what such a statue might mean. It can be difficult to understand how people would view a "cause" with such reverence, but the words they inscribed to express it are carved into the base of the statue, so we can read them and ponder it ourselves. 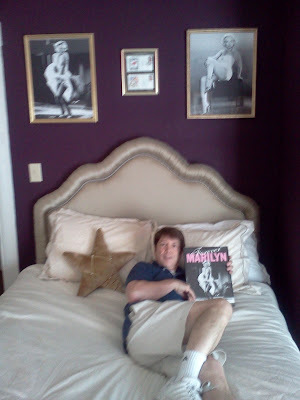 Don was a local guy who had worked with the Allman Brothers in their early days, who were based in Macon, headquarters for Capricorn Records, so he had plenty of stories and was fun to hang out with. 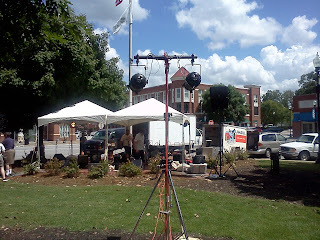 He also made us sound great, probably the best first-time sound man we've ever had. 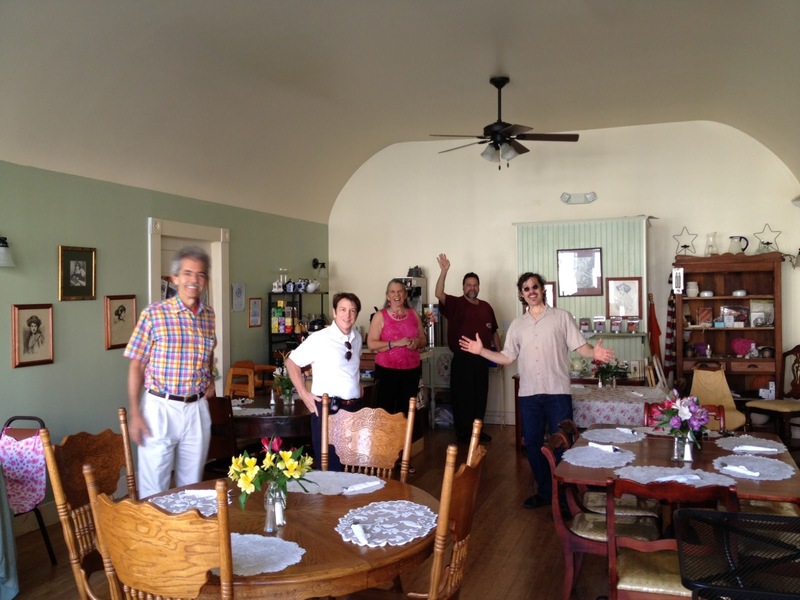 After our sound check, we walked our host Rick to where they had prepared dinner for us. It was supposed to be a "short walk," but after three blocks, Dennis said his concept of "short walk" had already been passed. 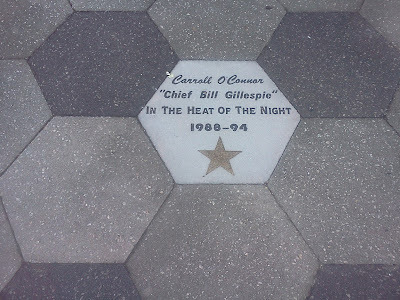 And along the way, we passed another symbol of Covington's affiliation with Hollywood, as a star with Carroll O'Connor's name had been installed in the sidewalk. And another two blocks, we found our destination, which was more than worth the walk - a magnificent and beautifully restored antebellum home called Twelve Oaks. We couldn't resist singing the theme to "Gone With The Wind," and as it turns out, we were right on target. 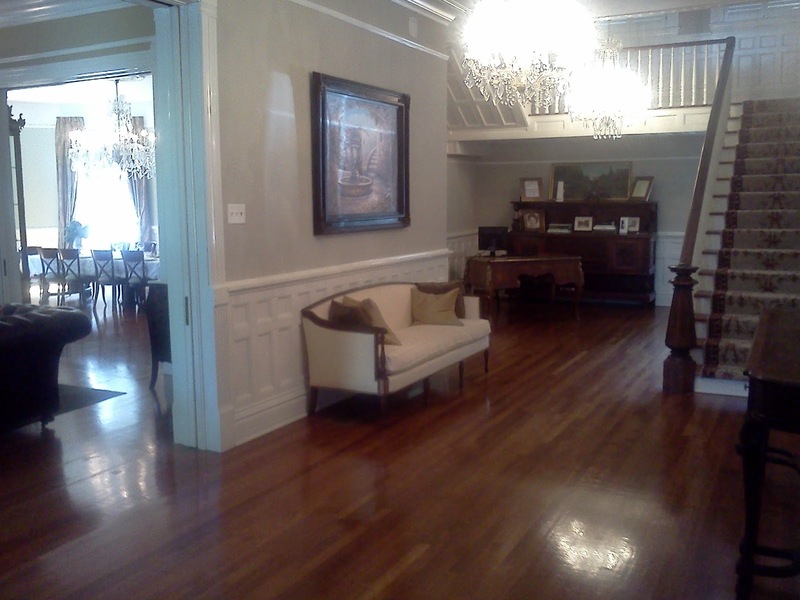 The house, originally built as a "town home" in 1836 by a local Judge Harris. 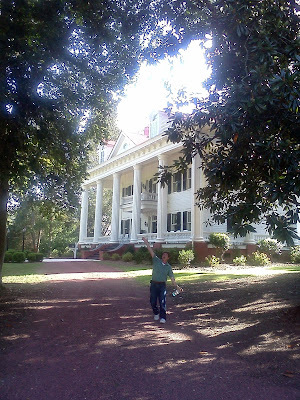 His plantation home nearby had been occupied nearly a month by General Sherman in 1864 during his march through Georgia, and thoroughly trashed. A photo of the house had been specified by Margaret Mitchell - in the 1930's, after the novel was published, but before the movie was made - as an ideal home for the character Ashley Wilkes. And the fine folks at MGM Studios painstakingly built a scale model of Twelve Oaks at their lot in Culver City, which is what they used for the movie. 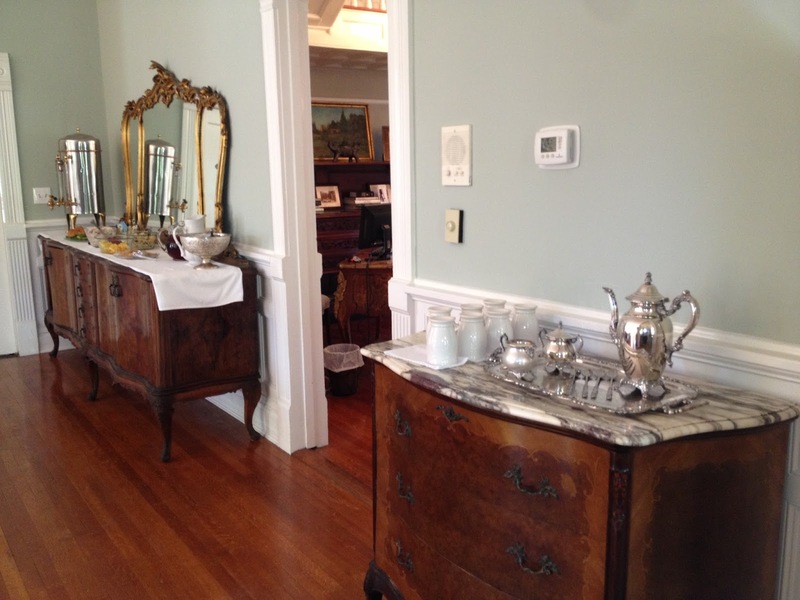 We learned more about the house from Nicole, who had recently bought it and launched the massive restoration process. She has turned it into a beautiful B & B. 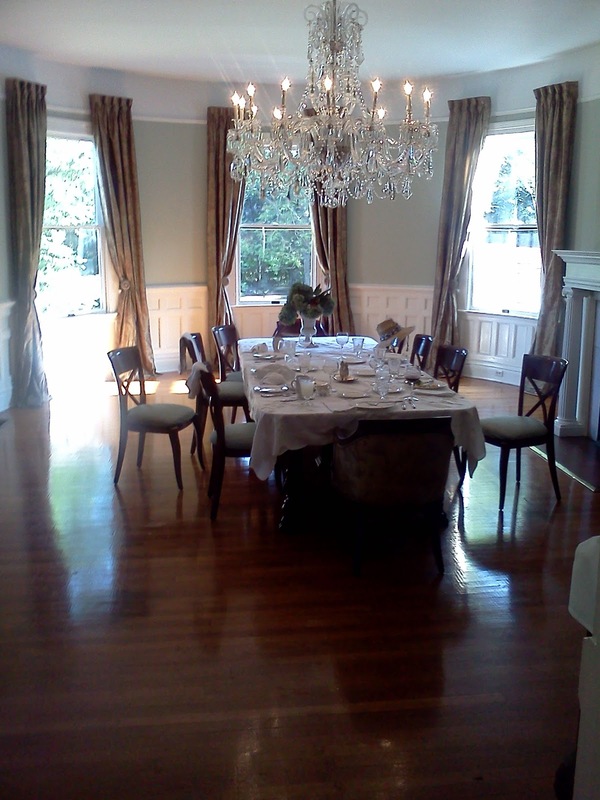 It was a beautiful place, and a great reminder of the grace and elegance that architecture can convey. 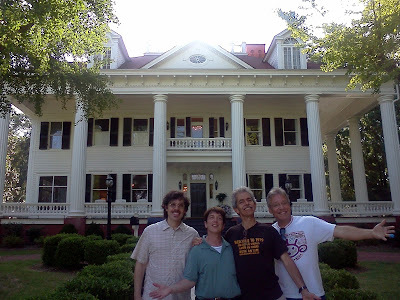 I was ambivalent about our visit to Twelve Oaks, because it was clearly a beautiful place to stay, but I had already accepted an offer from my sister for us to stay at her house in Atlanta that night. And that turned out to be a wonderful alternative, as she had prepared bagels, cream cheese and lox for our breakfast. And the other WannaBeatles could hear funny stories about my childhood from my sister. 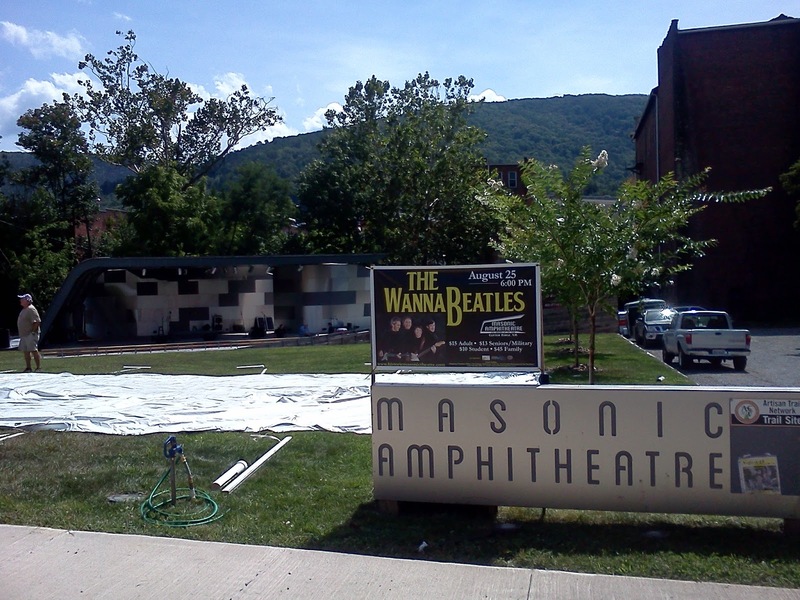 Another wonderful adventure for the family we call The WannaBeatles.